Red Hawk pitcher Peyton Newman allowed only one hit in his four innings on the mound against Grant. Courtesy photo. 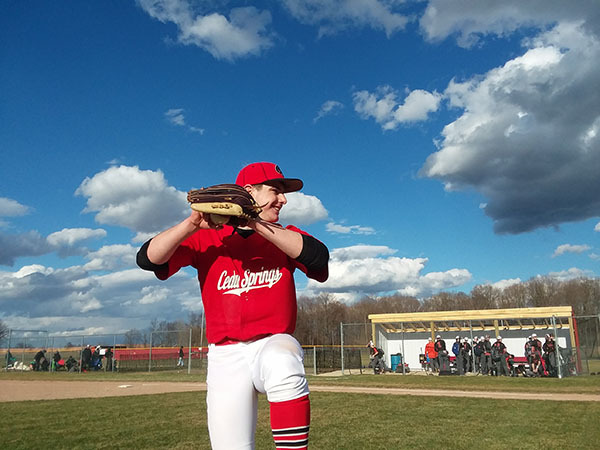 The Red Hawk varsity baseball team improved to 2-0 with a 10-2 victory over Grant on Tuesday afternoon. The Hawks were fueled by a great collaborative pitching effort. Peyton Newman threw four scoreless innings, allowing only one hit, walking two and striking out six. Nathan Male added two innings of middle relief, striking out two. Nathan Draper came in and closed out the seventh inning to seal the victory. At the plate, Thomas Reed again started off the game with a line drive shot up the middle. Junior Connor Ellison also added a pair of hits, as did Sophomore Bryce Marvel. The boys hit the ball well and were able to take advantage of a few mistakes made by Grant defensively. The results of the games vs Lowell will run next week.